Campsites in Somerset and sightseeing ideas will no doubt help make life easier if you are planning a trip to cider country. Here are a few idea. Somerset is a predominantly rural country best known for its rolling countryside and apple production – this is where most of the UK’s cider is made. It’s the ideal place for a weekend break or longer holiday in your motorhome, as this county packs a lot in to a small area. Here are our top places to see in Somerset, and ideas about where to stay on your trip. 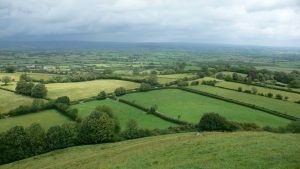 There’s plenty to see and do in Somerset and the area boasts some of the most historic heritage sites in the whole of Great Britain. Strongly associated with a music festival, there is lots more to see in Glastonbury than muddy fields and teenage revellers. 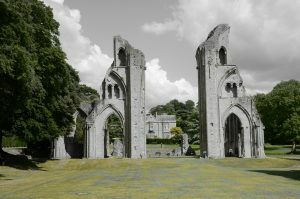 The main landmark in the village is the ruins of Glastonbury Abbey, said to be the resting place of King Arthur and a rumoured located for the Holy Grail. The church of St Michael is on the top of Glastonbury Tor at the edge of town, and the views from the top make the walk up worthwhile. 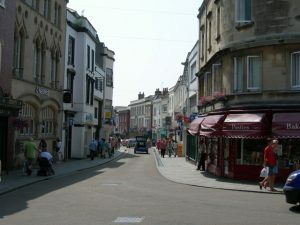 Glastonbury is famous for all things new-age and spiritual, and there are many shops in the town selling crystals or other new age accessories. The closest campsite to the town is the Isle of Avalon, which is 10 minutes’ walk into the town centre. 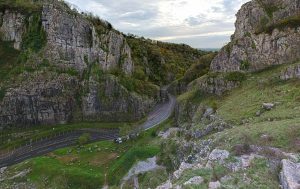 A natural formation in the limestone Mendip Hills, the Cheddar Gorge and caves are one of the most visited attractions in the area. There’s a visitor centre explaining the history of the area and visitors can descend into the caves which contains an underground river, stalagmites and stalactites. The area is also famous for its cheese production, and in Cheddar village you can visit the factory where cheese is made in the traditional manner. There is a campsite with pitches for caravans and motorhomes in Cheddar village. 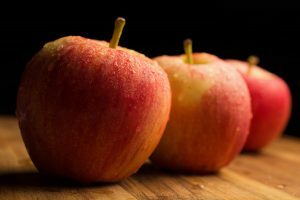 The Thatcher family has been making cider in Somerset for more than 100 years, and their orchards, cider making factory and tasting room is open for factory tours. This is a very popular tour, so get organised and book your slot online in advance. You’ll see all stages in the cider making process, from the apples growing in the orchards through to tasting of the range of different ciders made onsite. If you can’t book a slot on the tour, or just want to buy some cider to take home, there’s a large shop at the centre too. There’s a campsite at nearby Winscombe, and plenty of others in the Mendip Hills. Wells is often said to be England’s smallest city, as it’s not often you find a magnificent cathedral in such a small town. In addition to the cathedral, Wells also has a unique moated Bishops’ palace, which is open to visitors. Wells is the foodie capital of Somerset and there is no shortage of independent restaurants catering to all tastes. The Wookey Hole cave complex is also close to Wells, and this is also where you’ll find one of the nicest campsites in the area, at Lower Milton Farm. It’s not a high-tech campsite with lots of facilities, but perfect for those looking for a back to nature experience.